After all the hard work of cutting or felling a tree, stump remains. Well, you can remove it all by yourself by renting or purchasing a stump grinder. But, take into consideration that this is not an easy job. Do it if you have a wide knowledge using the equipment, otherwise, you will face the consequences. However, it is still the best option to call a company that caters Stump Removal Service in your area. It is highly needed much more to those multiple stumps and those with large surface roots that are digging down to a depth below ground level. Before removing a stump consider first the following. These will help you determine the proper technique and method to do the job quickly and easily. Consider the size and age of the tree. Typically, old and dead stumps are easier to remove than younger and larger one. Examine the health of the stump – is it contaminated with disease, dying, rotted, or active. There are roots run deep into the ground and can revitalise out of that material. It is better to know first what kind of tree does stump from to avoid big problem soon. This could mean a lot of work. In using stump grinding machine be aware that it is dangerous. Make sure to wear protective gear. This will also protect you from flying debris or wood chips. Stumps left behind in vacant land, front or backyard pose hazards. When homeowners attempt a removal, there is a greater chance of personal injury due to lack of experience and wrong equipment. Remember that there are different types of equipment for any kind of tree stump. For example, using stump grinding or chainsaw for large stump requires proper training and therefore master the equipment to ensure safety and efficacy. Which is why it is important to leave the job to the expert. Tree stump should not remain in your yard. It can possibly cause the disease to other plants when pests or insects start to dwell on it. It is also a potential place for rats or termites that crawl into your house. Additional trouble perhaps. On the other hand, it raises peril to places like a playground or park. Some may not notice its presence and bump at it. Though stump removal holds more in deep operation than the other tree works. But, like others, it also beneficial for gardening purposes particularly in a nature-inspired garden. It turns into a pretty pot for flowers, an old bench that dots in the center of the garden, a tiled path out of sliced wood, and many more. Indeed, a lot of artistic designs are made of tree stumps. It turns into a beautiful house for your fairy garden business, a roller chair, a side table, a lamp strain, etc. So, for reuse and recycling purposes, it is better to call the service for proper removal thus this will not impose you harm and will take the job faster and easier. Here, in Tall Timbers Tree Services we do scrutinise every species of tree. Young or old, active or dying, large or small. In years of business, stump removal is an easy job. We do this repeatedly for how many years. That is why there is no impossible with us. Be of service to our powerful machinery and fortified team. We are here to serve you with dedication and fulfilment. 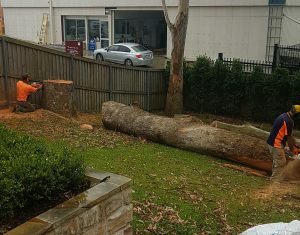 We cater Stump Removal, Pruning Tree, Tree Removal, Tree Lopping Sydney and to the greater west, north and south coast. Tall Timbers Tree Services was founded in Sydney in the early 1990s by Phillip Couzal. We are proud to say that we should be your first line of experts to call when it comes to anything tree or stump related in Sydney. We have over 20 years of tree management experience and offer a superior service and knowledge of all aspects of the tree services industry. We hire arborists directly, so you will always be dealing with a trusted and qualified employee of the company. © 2018 Tall Timber Tree Services. All rights reserved.